Optimized to reduce transaction time and manual entry errors, the Mini MICR is a sigle-feed MICR reader with a reliable and durable design. Ideal for retail applications where fast and accurate MICR reading is required, the Mini MICR offers a range of interfaces options, including connectivity to the most popular POS terminals. With a simple drop-and-push check feed movement, the Mini MICR significantly speeds check verification and conversion. The Mini MICR enables retailers to easily format the MICR data to match any application input requirements. In a single pass, the Mini MICR reads E13B and CMC7 MICR fonts and connects to POS terminals through a USB, RS-232 or PC keyboard wedge interface. 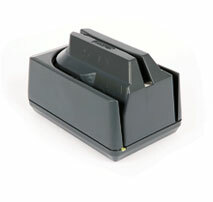 Designed for multi-use retail environments, the Mini MICR also offers an optional 3-track magnetic stripe reader to read ISO and AAMVA standard credit and debit cards and ID cards. This highly dependable device will deliver superior performance throughout years of daily use.